Earlier today we posted that the Dell Venue Pro, a Windows Phone 7 handset had passed the FCC with AWS bands and would be launching soon. 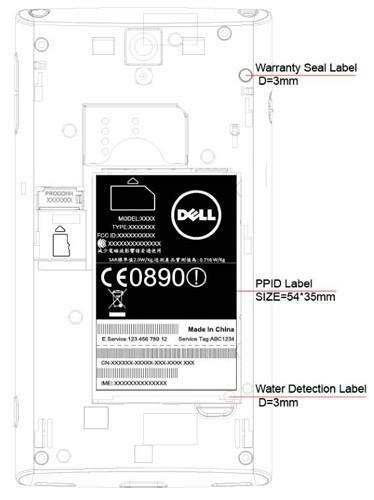 Now, the FCC has passed another Dell handset which also sports AWS bands (hooray) and is named the Dell Venue (model code: V03B002). The Dell Venue (aka Dell Thunder) is basically exactly the same (hardware wise) as the Windows Phone 7 powered Dell Venue Pro, but the Venue is running the Android OS. Before you start jumping for joy, even though the handset has AWS bands does not mean it is a lock for T-Mobile. Take the Dell Streak dilemma for example. Leave your thoughts in the comments! Wow. Will this have the 8MP camera? I’ve been waiting for this phone…….Now I’ll wait to see if it’s going to be on t-mobiles network before considering the mytouch 4g more seriously. Looks good. Be curious to hear more details about this device. Unless they’ve bumped up specs from last reports, it’s not quite up to the myTouch4G’s snuff. It’s not likely to have as much RAM and I don’t think (I could be wrong) it has the next-gen Snapdragon the myTouch4G has. Does the FCC filing say if it supports HSPA+? If it doesn’t, no deal. So, does this have that slider keyboard like the pro or no? The Engadget pics do not seem to indicate so. Kind of a bummer if no because I am in the market for a phone with a keyboard other than the G2. It’s good to have options, ya know? Yeah doesn’t look like there will be a keyboard. I’d take the lightning with android on it too. Not gonna be an early adopter with WP7 unless of course XDA can manage to get android working really well on it pretty quickly. wow.. lots of nice phone coming to tmobile! nice..
hmmm everybody happy now? LOL..
i love my vibrant, but somehow i feel like my phone is outdated already with all these new phones coming out.. lol, im stuck with it till next year, :) it’s cool i love it a lot anyway and it’s a great phone. but this phone looks nice and expensive-looking.lol and next year when i upgrade, im sure there’d be better and better phones available by then. LOL, I think this one deserves to stay! Now hopefully the MS haters will stay out of the WP7 Venue Pro post. Wait wait what what? Is there a first comment? I”m on the hunt now! This looks interesting. It makes me wonder what Sammy has ups it’s sleeve with the soon to be announced phone coming next week.